The Westminster Wildcats girls soccer team (7-1-1) showed the Grady Knights its “wild side” blanking them 2-0 on Tuesday at Grady Stadium. The long-awaited rematch ended in the same fashion it did four years ago. Despite the final score, the team (4-5-1) took some consolation in how well it competed. The team was successful at achieving its goals for the game, except for one: they couldn’t get the ball in the opponent’s goal. The Knights dominated possession in the first half with good ball movement and “successful plays,” White said. Grady did well at keeping the Westminster defense and goalie on their toes throughout the first half, having more shots on goal than Westminster including two close corner kicks that could’ve been game changers. Instead the Knights squandered the opportunities. After a a loss of possession by the Knights, the Wildcats caught the Grady defenders too far forward and counterattacked. A Westminster wing sprinted down field with only one Grady defender to beat. Before the defense could close in on her, the wing unleashed a shot from the right side of the box. 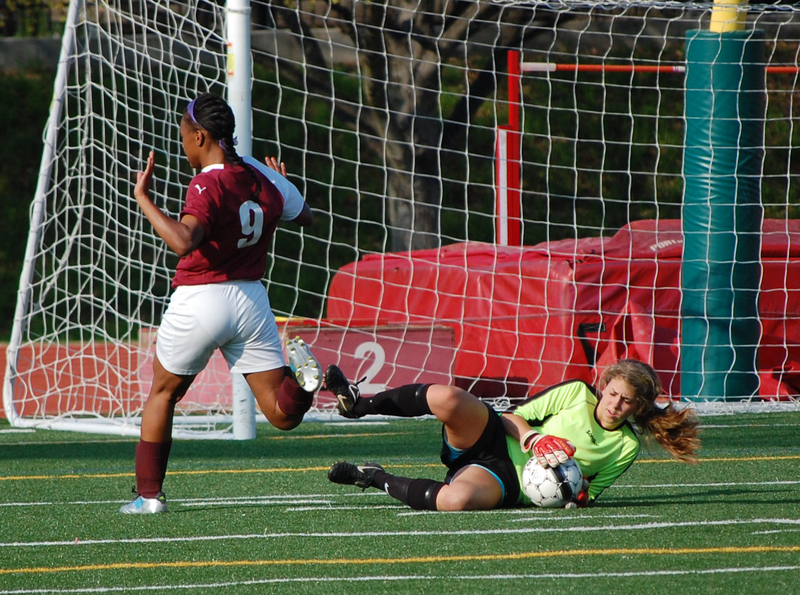 Grady goalie Emma Lee got her hands on the initial shot, but the rebound took an unlucky path to the feet of the Westminster striker, who finished the easy put away for a 1-0 lead with 15:29 left in the first half. Despite the Westminster tally, Grady still came out strong setting themselves up for another score before the halftime horn rang. The Knights earned another corner kick, which landed in the box after bouncing off a few bodies and leaving a Grady player with a small window to shoot through, because of all the traffic in front of the goal. The player was able to get a shot on goal, but the Westminster goalie blocked it away and a Wildcat defender clear the ball down the field and out of danger. In the stands you could hear the fans expressing their disappointment after the team missed such a golden opportunity to score. It was the closest Grady would came to scoring the whole game. Westminster controlled the second half of play. They possessed the ball for the majority of the half giving Grady’s defense lots of practice. For how well Grady played in the first half, in the second half it looked like they had already retired from trying to score. The defense looked good, but every time the Knights earned possession, they would turn the ball right back over to the Wildcats. The incessant Wildcat attack was bound to produce an insurance goal. With 20:46 left in the game the same Westminster striker who initiated the Wildcats first goal snuck past the last Grady defender again, creating a one-on-one between her and Lee. Lee came out aggressively and attacked the striker, but the striker took advantage lofting the ball gets right over Lee’s head leaving nothing but the Westminster striker, the ball, and the back of the net for a score of 2-0. White believes the Knights must “play faster” if they are going to compete against the top teams in the state. “We need to quicken our touches and passes so the overall game moves at a faster pace,” White said. NOTES: With the 2-0 shutout, the Wildcats extended their scoreless streak against Grady to five games. The aggregate score of the five games is 17-0. The Knights hope for a different outcome in the two teams next match-up. That game may be after some of the current players graduate, however, considering that the two teams are in two completely different regions. UPDATE: After Tuesday’s loss, the Knights rebounded on Wednesday by defeating North Springs 6-0. The victory evened the team’s overall and Region 5-AAA record to 5-5-1 and 2-2 respectively. Westminster, meanwhile, tuned up Wednesday by blasting South Atlanta in a 10-0 shellacking that improved the Wildcats to 8-1-1 overall and a perfect 4-0 in Region 4-AAA.